Imagine this: You go to the doctor. You're a little overweight, your blood pressure's a little high, your blood sugar isn't quite where they'd like to see it. They tell you to eat better, to get more exercise, to quit smoking—the usual. But then, instead of just sending you packing, they hand you money—$125 in vouchers to buy fruits and vegetables at your local farmers market. This isn't just imaginary—it's real. It's called Fruit and Veggie R/x, and it's going on at health centers and farmers markets in Holyoke, Lawrence, and Boston, Massachusetts; and Portland and Skowhegan, Maine. It's a program of Wholesome Wave—a non-profit dedicated to increasing access to healthy local foods for low-income and rural populations—and it's getting help financially from CAVU (Ceiling and Visibility Unlimited) and the Massachusetts Department of Agriculture. I found out about it through Gus Schumacher, the Executive Chairman of Wholesome Wave, who spends his summers in Orleans and is a frequent shopper at the Orleans Farmers' Market. Schumacher has quite a resume—he worked as Massachusetts Commissioner of Food and Agriculture in the 1980s and Under Secretary of Farm and Foreign Agriculture Service with USDA in the 1990s—and he's always had the same goal. He wants to make families healthier. Back then, he did that by working to help develop the Women, Infants, and Children and Seniors Farmers' Market Nutrition Programs (click on over here for more local information). Today, he's doing it by trying to show the government that fruit and veggie prescriptions can have a measurable impact on health, and with any luck, getting Congress to consider funding the program as a preventative healthcare initiative under the new health bill. In the long run, as Schumacher likes to point out, fruits and veggies are far less expensive than doctors visits and drugs. The program is still very much in its pilot stages—it just got started this summer—but pretty soon, Schumacher is hoping to start seeing results. Then, the goal is to get a peer-reviewed article written documenting what the doctors have found. If it seems basic—well, it is. But maybe simple and straightforward is what we need to start making changes, and putting fresh, healthy food back on the table. It isn't going on the Cape yet, but there's a clinic in Eastham Schumacher's interested in, if he can get enough funding to expand. Let's hope! You can find out more about the Fruit and Veggie R/x program over here, and more about other Wholesome Wave projects over here. Scan and photograph are courtesy of Gus Schumacher. This is so cool! 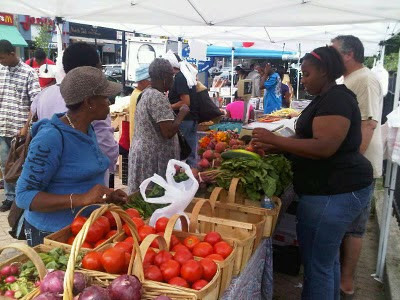 This Community Health nerd is very happy to hear that farmers market incentives programs are reaching more people now. I've heard of farmers market vouchers being given out based on income (food stamp/WIC vouchers), but never based on poor health. Glad to see more and more people are realizing the impact of farmers markets and fresh, local food on health. I'll have to keep an eye out for these things at the Portland market! Way cool! Wish we had a farmers' market that was closer to Wellfleet. I agree. Although I do think this program is also biased toward low-income people, it's nice that it is reaching out in a new way—through health rather than simply through income. I would be very curious to hear if you see any in Portland! Keep your eyes peeled and let us know. What a fabulous program! Thank you for helping spread the word. It's amazing how biased toward fruit juice and cow's milk (and cheese) the WIC program is, and I know it changed last year for the first time in many years to at least include beans (dried or fresh) as well as a couple of other options. (In laughable amounts, but at least it's something.) After it changed, supposedly to be more healthy for participants, the allowable cheapest brand cow's milk now has to be purchased in 2% or lower milk fat. I'm very encouraged to see this pilot program and I hope it will expand. Thanks for telling us about it! It's true that not so long ago local food was the only option, and it's interesting how the tables have turned. It seems to me the first step is healthy and the second step is local and fresh, and this program seems to accomplish both neatly. That is interesting. I had no idea how biased it was, but it's good to hear beans are now an option. I also have my fingers crossed that this pilot program will expand to the Cape—I think it would really be great for our community! Amazing--hope to see this idea take root in many communities. Great reading to encourage support of local farms (and businesses) is Wendell Berry's ANOTHER TURN OF THE CRANK. It is a great--short!--read. Mr. Berry always seems to have the answer, or at least the perspective. A good reminder! Elspeth,I am so happy to hear about this program! Maybe because its still in its infancy, we haven't heard anything about it up here in Brunswick. I hope that there is followup to see how successful the program is. I think its a great motivator to encourage that segment of the population who probably is intimidated by a farmer's market anyway! I'm not sure who the coordinator is in Portland, but check out the Wholesome Wave website for more information. They are doing so many good things—this is just one of many! Let's hope it makes its way to both of our towns soon.